“Overall I was completely satisfied with the service and the service personnel”. “Always helpful and accommodating. Cannot fault the service”. “The Sales Executive was fantastic and I really appreciated that he fully listened and understood my needs. He found the exact model I wanted and kept me updated regularly as to a delivery date as he was very aware I needed it for work. He was very efficient and personable”. “The service was friendly and efficient”. “Very prompt and helpful. Good communication from Haynes reference conveying information about the appointment, completion of the job”. “Excellent service never have to worry when I leave my car there”. “The service was so quick and easy and a total pleasure to deal with Haynes. Wonderful from start to finish”. “The dealer showed me how to use everything on the vehicle before leaving the forecourt”. “Answered questions simply without trying to be clever and appear as if he knew it all. All I ask is for a simple question to be given a simple answer and that’s what I got”. “The Sales Executive knew what I needed and helped me finally decide what to go for”. “Generally the whole process was well run”. “They are friendly and always carry out whatever they say they will within the agreed time (Sales and Servicing). I have already recommended them to a friend who has also bought a car from Haynes”. “Quick and efficient service in reception both on delivery and collection of the car”. “The Sales Executive listened to me and it was totally down to him that I purchased my car and kept me informed during the whole process. As well as follow up calls since. I cannot praise him highly enough”. “I felt valued as a customer”. “The car following its service was very well cleaned both inside and out. 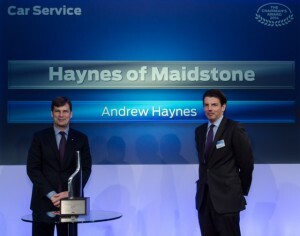 We have been going to Haynes for the best part of 40 years and have always found them obliging and efficient”. “I received a text message when my car had been serviced and was ready, which I appreciated as it was keeping me informed”. “For me the experience went extremely well. The service was booked, I took it there, they rang me to say it was ready, I collected – job done. No fuss, no problems. Happy customer”. “I always get a good service from the people at Haynes”. “Happy with MOT and service”. This entry was posted in feedback on September 3, 2015 by Kay Bangle.